Gills free, close, at first pallid, then pale pinkish-tan, dark chocolate-brown in age, edges colored like the faces; lamellulae in five to six series. Stipe 2.0-7.0 cm long, 1.5-3.0 cm thick, more or less equal except for a bulbous base, with a narrow, cottony central core; surface of apex pallid, finely striate; lower stipe variable, glabrous to sparsely covered with whitish fibrils, occasionally sheathed with cottony-floccose veil remnants, yellowing like the cap; partial veil two layered, the under-surface cottony-fibrillose, sometimes fragmenting leaving scattered cottony patches over a membranous-tomentose basement layer; annulus superior, thin, initially erect, then pendulous to appressed to the stipe. Spores 6.0-7.5 x 4.0-5.0 µm, elliptical in face-view, similar in profile, inequilateral, smooth, moderately thick-walled, hilar appendage inconspicuous, germ pore absent. Solitary, scattered, or in small groups under oaks at low elevations and in montane conifer woods; fruiting in the fall along the coast and in the spring in montane regions; occasional to common in wet seasons. 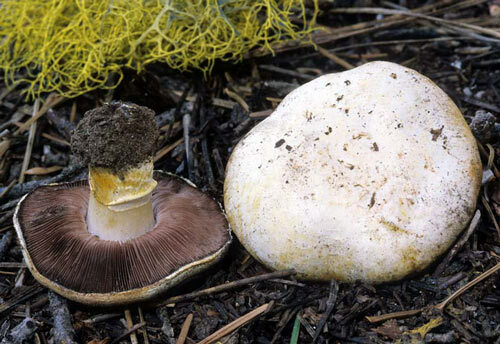 Like other members of the Agaricus arvensis clan, Agaricus albolutescens has a pleasant anise odor and bruises slowly but persistently yellow, characters that distinguish it from Agaricus xanthodermus, a mildly toxic species which has a phenolic or medicinal odor, and bruises fleetingly yellow, i.e. fading usually within minutes. 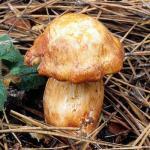 Fieldmarks of Agaricus albolutescens include a stocky stature, tendency to discolor tawny-brown, not merely yellow, and chocolate-brown free gills. Agaricus silvicola is very similar but has a less dramatic bruising reaction, more yellowish than tawny, a normal rather than stocky stature, and slightly smaller spores. It is possible that Agaricus albolutescens and Agaricus silvicola represent a single polymorphic species or a species complex. Further study is needed to resolve this question.